Although Naxos is generally a calm and relaxing island, there are few watersports centers with fun games in its most popular beaches. The majority of Naxos watersports are found in the beaches of Plaka, Saint George and Agios Georgios, the three main beach resorts on the island. There you can find games for all ages and preferences, from waterskiing, kneeboard, jet ski, bananas, canoe kayak, stand up paddle and more. Enjoy a fun day at the beach with watersports in Naxos and get the best memories. For more action, you can also try windsurfing and kitesurf, which are also very popular sports on the island. Here are some watersports in Naxos. Each watersports center is presented with detailed text, photos and point on Google map. If you have visited any of these centers, feel free to write your review. All request forms go directly to the manager of the center, so that you can make a reservation in person or ask them any question. Plaka Watersports has been in business since 2000. 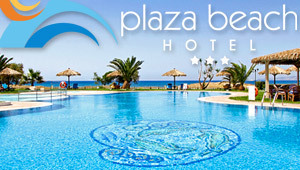 It's located at the beautiful, long and sandy Plaka beach, in the west part of Naxos. Our goal is to create a safe and friendly environment, where our customer is our guest and his safety our first concern. Combining professionalism with a friendly attitude we provide our customers with the best possible service.